Recently, for various reasons, I have been rediscovering my latent appreciation for fine wine. So when Drake and Morgan invited us down to Monument to their 'The Folly' restaurant and bar to experience their 'La Petite Provence' pop-up, I really couldn't resist. Set up deep within the City, the Provencal pop-up was designed with a rustic edge - vintage shutters, shabby chic French furniture and French landscape photography. The attention to detail made the indoor garden a little French haven, dotted with lavender flowers, rosemary leaves and terracotta pots. 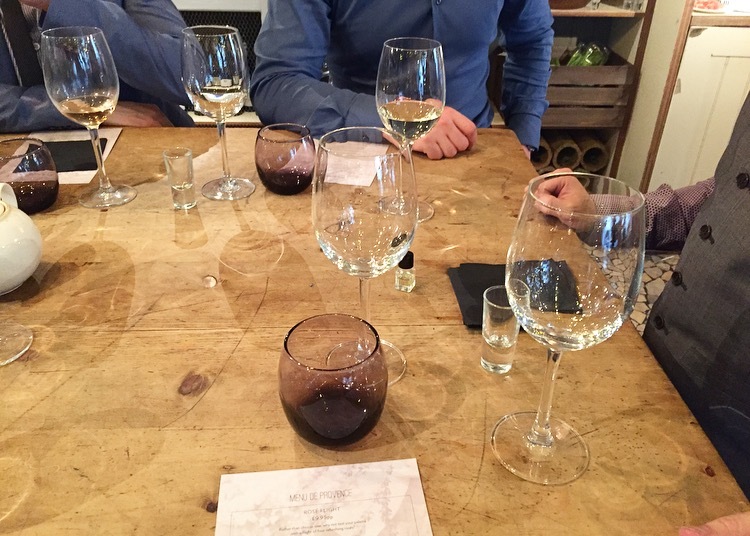 As we sat down at the table to begin our sensory experience, the sommelier talked us through the range of wines we were to be tasting. We sampled a selection of Provence's finest wines whilst blindfolded, letting our pallets determine the type of wines we were tasting. The wines were a great range from fruity to dry and to make the evening a little more interesting, we were required to guess which flavours/foods would go with each wine in turn. It was a lot of fun. The pop up is up until the end of August- if you a wine lover I would recommend this experience as it is an informative and enjoyable experience. You can book a table through at The Folly Bar and follow the venue on twitter @thefollybar.